As this evidence mounts, WorldFish is harnessing its success in boosting carp-mola polyculture in Bangladesh to scale the technology to the Indian states of Odisha and Assam. Mola can grow up to about 10 cm long and, as it breeds in the pond, must be harvested frequently. When farmed together with larger fish such as carp species—an approach known as polyculture—mola makes up 15 percent of the total fish production by weight. Despite comprising a relatively small proportion of the total production, the new research published in Food Security—Homestead pond polyculture can improve access to nutritious small fish—found that mola contributed 98 percent, 56 percent and 35 percent of the total vitamin A, iron and zinc produced, respectively. Because of its small size, mola can be eaten whole, meaning people consume the eyes, head, bones and internal organs which are rich in minerals and vitamins. With large fish, however, it is mainly the flesh that is eaten, which has much fewer micronutrients than in the whole fish. Also, mola contains very large amounts of vitamin A in the eyes, unlike carp species and other large farmed species. A woman cooking mola and orange sweet potato curry in her kitchen in Jessore, Bangladesh. The research is based on results from the USAID Feed the Future-funded Aquaculture for Income and Nutrition project (2011–2016). It highlights the tremendous potential of mola as a food-based approach to combat malnutrition in Bangladesh, where over 70 percent of children (from preschool age to 14 years old) have vitamin A deficiency and 48 percent of women of reproductive age have anemia. 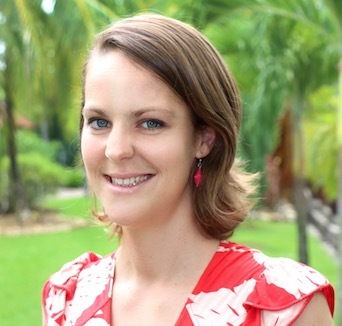 Malnutrition in Bangladesh is largely due to low dietary diversity, caused by diets comprising of 70 percent rice by weight, and inadequate intakes of micronutrients says Dr. Sarah Castine, the lead author of the research and former postdoctoral fellow at WorldFish. “Consumption of mola can therefore greatly benefit women and young children, by promoting optimal growth and cognitive development, particularly in the first 1000 days of life. “If the mola produced is consumed within the household, it could contribute half of the vitamin A and a quarter of the iron intake recommended for a family of four, annually,” Dr. Castine says. These potential and significant development impacts are behind WorldFish’s push to continue scaling up carp-mola polyculture in Bangladesh and to start similar work in neighboring India. In India, the eastern state of Odisha is rich with aquatic resources and has a population that values fish as an important animal-food source and part of their culture. 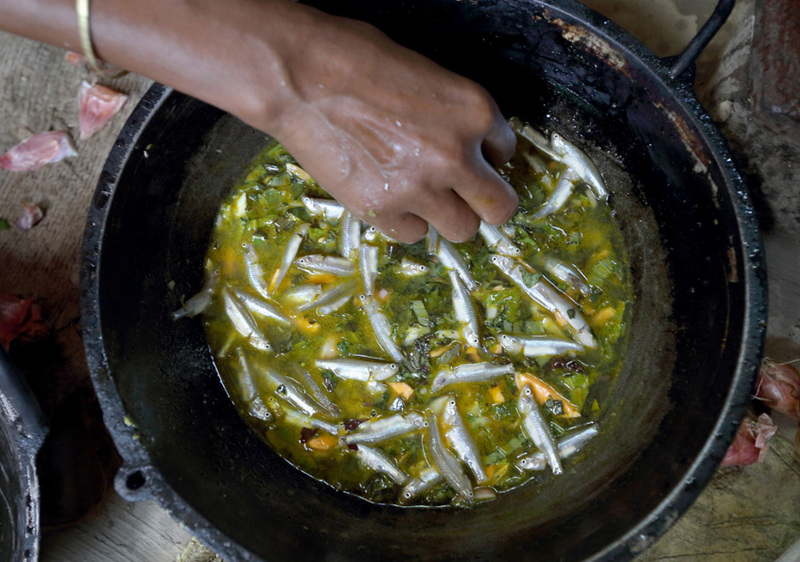 Despite this, low fish intake among the poor, women and young children contributes to high rates of micronutrient deficiencies, with 45 percent of children under five stunted. Through a five-year partnership (2017–2022) with the Fisheries and Animal Resources Development Department in Odisha, WorldFish is working to increase production of mola—a fish indigenous to the region—as part of a multi-prong approach to boost nutrition-sensitive aquaculture in the state. By 2022, it is expected that these efforts will lead to mola being included in the diets of 40,000 children and 10,000 mothers in Odisha. 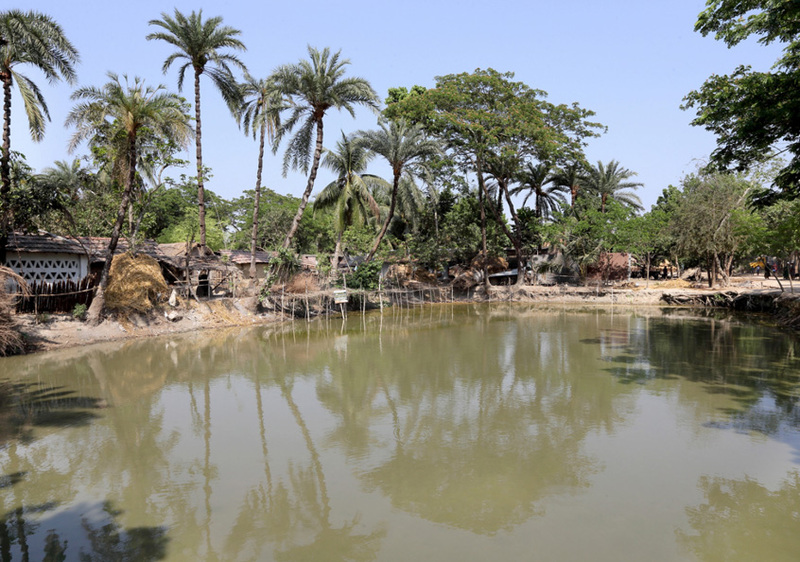 A pond being used for polyculture of small fish, carp and rui in Jessore, Bangladesh. The work to scale up carp-mola polyculture in Odisha will be based on WorldFish research and lessons learned in Bangladesh, where more than four million households have ponds close to the homestead. Since 2011, WorldFish and national partners have been training and supporting poor, rural households with idle or underutilized ponds to establish carp-mola polyculture systems. These efforts have been targeted at women, who engage in and benefit less from aquaculture than men and tend to suffer more from malnutrition, explains Dr. Castine. In addition, by targeting the training at women, who do the food preparation, this increases their access to nutritious small fish. 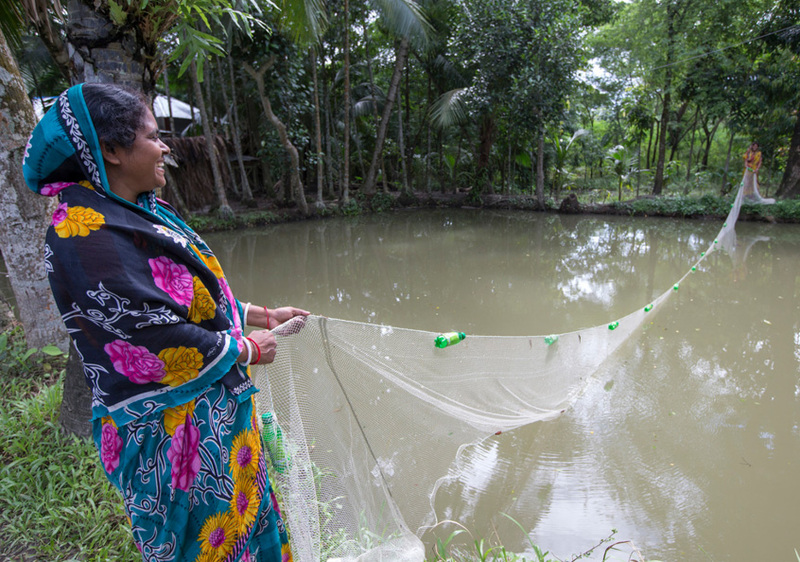 “Mola breeds in the pond, and can be partially harvested frequently, using a simple and low-cost harvesting technology developed by WorldFish and partners to suit the needs of women. This therefore enables poor households—including women—to increase their consumption of fish,” she says. For the poor, who often have few resources, the farming of mola is an ideal way to engage in aquaculture. “A farmer can stock her pond with three to four kg of mola brood stock sourced from natural resources or another pond for the first time. The mola feeds on algae that naturally occur in the pond. And if the pond is seasonal, mola brood stock can be retained by digging a small hole to hold water in for the year,” Dr. Castine says. 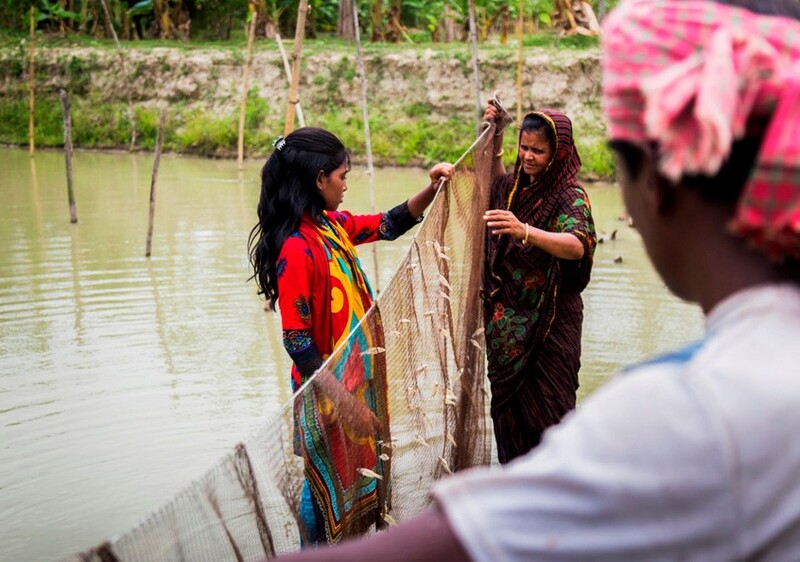 Women harvesting mola in Khulna, Bangladesh. WorldFish and partner efforts have led to a huge uptake of carp-mola polyculture in Bangladesh. Continuing efforts by WorldFish and others, in partnership with the government and private sector, are now needed to further scale up mola production in Bangladesh and India—and fully realize the significant nutrition gains that can be achieved from the farming of nutritious small fish. Further research into the production techniques of other small fish species, besides mola, and the power dynamics between women and men in managing homestead ponds will be critical to this goal.